Pyrénées - Mont Perdu is a visually dramatic mountain landscape centered around the peak of Mont Perdu. The protected area lies at the tectonic collision point of the lberian and west European plate, and on the border between Spain and France. Both sides vary greatly in natural setting and climate. The Mont Perdu mountain range is the centrepiece of the Pyrénées and has several important geological, scenic and botanical values. It features many lakes, canyons, cirques and distinctive alpine flora. Most magnificent of the fauna species found here is the Lammergeier (Bearded Vulture) with a 3 metre wingspan. The Pyrenees is one of the rare places to see these birds in Europe. The site also is a cultural landscape, where the centuries-old transhumant system of grazing continues within the area with frequent movement of herds across the French-Spanish border. As all other reviewers until now, I approached this WHS from the Spanish side through Ordesa National Park. The town of Torla is an easy and comfortable access point. At 7.30 a.m. I took one of the first shuttle buses of the day into the park. There were 10 other hikers aboard, certainly not a lot for a Saturday in July. The Mont Perdu WHS apparently sees more than 2 million visitors yearly (Spanish and French totals combined), which is hard to believe given its low key appearance. I had been in doubt about which hike to do: the longer trail along the ridge (Senda de los Cazadores), or the shorter one through the valley. My experiences from a few days before in the Madriu Valley made me choose the shorter trail: I am not fond of climbing a lot, or getting soaking wet due to a surprise rain shower. The valley hike is still 17km long and takes 5 to 6 hours. Both trails end at the Cola de Caballo-waterfall. The valley hike has three distinct parts. It starts with an uphill slug through a forest, not the most interesting stretch and it took me 1.5 hours. Things brighten up a lot when you’re in the open at last: the path next to the river is lovely. I especially liked all the flowers in bloom, their colours and smell. 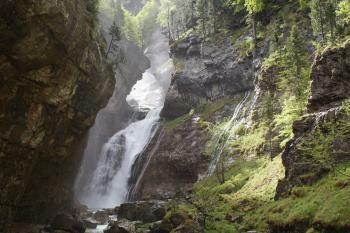 After a series of steep waterfalls, you’ll reach the alpine plateau with views of Mont Perdu. It gets much cooler here. A herd of cows was lazing around near the finishing point. In all, a fine scenic walk but a pity that you have to walk the same route back. The next day I had some hours to kill before my flight home, and I decided to visit another part of Ordesa National Park. The Añisco Canyon lies beyond the village of Fanlo, about 40 minutes to the east from Torla. It is not signposted very well so you’ll have to look for directions beforehand (my car navigation also wasn’t helpful). Central point is the Ermita de San Úrbez, an 8th century hermit’s cave and pilgrimage destination. I approached it from the upper car park, which leaves you with 2x 15 minutes hiking time to the site itself. The lower car park can only be reached from the other side of the canyon. It lies next to the bridge to the hermit’s cave. There’s a fine 1 hour trail that leads you along various viewpoints into the canyon. As noted in our Connections section, the Ermita de San Úrbez also is the home of another WHS: a piece of Rock Art of the Mediterranean Basin is also here. But where is it? I vaguely remember having read a description that it can be found just outside the cave, however there’s no sign or any other indication. What a weird WHS this Mediterranean Rock Art is, I think it proves a country cannot maintain 727 separate locations! A bit disillusioned I walk back to the parking lot. Suddenly I see a huge bird oozing through the canyon. There’s no doubt – it must be the bearded vulture with its enormous wingspan and white head. I had seen some others the day before but from a large distance, so it wasn’t clear if these were bearded or “regular” (griffon) vultures. Seeing one passing by so closely was a magnificent finale of my visit to Ordesa NP. 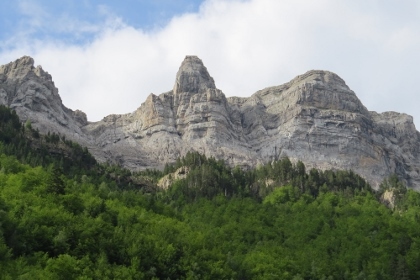 In May 2014, we spent three days in the National Park Ordesa y Monte Perdido, the Spanish part of this transnational WHS. 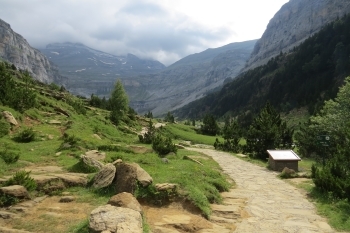 Beside the Monte Perdido summit the inscribed area comprises four deep valleys that are accessible to hikers: Ordesa, Añisclo, Escuain, and Pineta. We went for two hiking tours in the Valle de Ordesa and one in the Canyon de Añisclo . There are hardly any roads in the National Park, one of the few is the access road (HU-631) to the Añisclo valley from Escalona. The ride on this very narrow and winding road was exciting and offered wonderful views into the deep gorge. After 12 km we reached the parking lot at the Ermita de San Urbez. The Añisclo valley is a very narrow canyon between steep, almost vertical cliffs. The hiking trail runs continuously uphill along the Bellos river and through forest and lush vegetation. It is easy to walk, there are only a few steep sections. After about 3.5 hours we reached the Fonblanca waterfall and returned on the same route to the parking lot. We enjoyed very much our hike through this striking landscape, but the Valle de Ordesa was even more impressive. 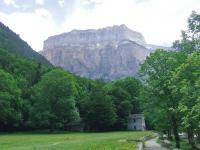 The starting point for tours in the Valle de Ordesa is the picturesque village of Torla. From there it is only 5 kilometres to the parking lot Pradera de Ordesa (at 1350 metres altitude) where several hiking trails start. Ordesa is very popular with hikers and climbers, the parking lot is huge and in summer the access is restricted for private vehicles, you have to take the shuttle bus from Torla. However, when we arrived at 8 am, there were only a few other cars, probably because of the heavy rainfall the days before and the rather cold temperature of only 5 degrees in the morning. But after the morning mist has lifted, it was a beautiful warm day with clear blue sky. As described by Clyde in his review below, there are hiking trails of different grades and at various altitudes. Our first hiking tour started with an exhausting steep climb up to an altitude of 2000 metre (650 metres vertical difference). Then we walked on the Faja de Pelay slightly downhill to the end of the valley, the Circo de Soaso. We enjoyed magnificent views of the rock formations on the opposite side of the valley and the snow-covered peak of the Monte Perdido. 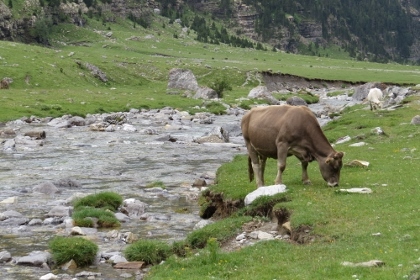 The Circo de Soaso is a picturesque spot: a green meadow with a babbling stream and a waterfall, surrounded by steep rock walls. And to make it perfectly picturesque, there were also grazing cattle. 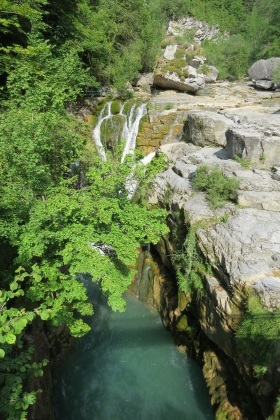 The trail back to the Pradera leads through deciduous woodland and past spectacular cascades (photo: Estrecho waterfall). There are signposts to several viewing points, all are worthwhile. The next day, we hiked along the rock wall on the north side of the Ordesa Valley (at a maximum altitude of 1800 metres): the Faja Racon, Circo de Cotatuero, and the Faja Canarellos. I agree with Clyde, that the easy trail in the valley is the most scenic hike, and the trail is suitable also for less experienced hikers. We enjoyed the three days in this scenic mountain landscape. The deep canyons and steep rock formations of the Monte Perdido massif are outstanding and differ significantly from landscapes in the Alps. We stayed at the lovely Hotel Abetos in Torla, about 300 metres outside the village centre. I visited this WHS in May 2014. I spent 3 days hiking in the Ordesa Valley and I saw Mount Perdu both from strenuous uphill trails like Faja de Pelay at high altitude (not suitable for those who don't have a head for heights) as well as from the easy trail in the valley with lovely cascades, streams and waterfalls. I must say that the most picturesque hike is indeed the easy hike by the Rio Arazas which takes about 7-9 hours if you stop for lunch and to take lots of photos. If you start early at around 7am you will beat the crowds and it really is a very enjoyable trek with rainbows forming early in the morning over the many cascades and waterfalls. The UNESCO plaque is immediately visible after a few minutes of hiking. The Cola de Caballo waterfall is beautiful but you should arrive early there as it's also the place where everyone stops to have lunch. I was surprised that I didn't have to pay an entrance ticket of any sort. All you need there are good hiking shoes and an empty bottle to fill with pure water from the gushing streams. During 3 days of hiking I spotted the rare Lammergeier (Bearded Vulture) amongst different birds of prey and scavengers as well as smaller birds. I was lucky to spot a couple of marmots and 2 big castors near Cola de Caballo and I also enjoyed the varied mountain flora with different kinds of butterflies flying freely around. This is truly a magnificent WHS and one of my favourite transnational mixed WHS in Europe. The scenery in the Ordesa Valley I found reminiscent of that of Yosemite: high rock walls with numerous waterfalls. I reached the park by travelling by bus from Sabananigo (on the Jaca to Zaragoza rail line) to the attractive village of Torla. After paying the 4.50 euros to enter the Ordesa National Park I boarded the free bus that stopped first at the visitor centre at the entrance to the park, then at the Pradera car park inside the park. This is the starting point for a number of walking tracks around the park. By following the Rio Arazas to the WHS plaque I reached the view of Mount Perdido. Tectonic processes: Criterion (viii): ...The region is distinguished by its location at the tectonic collision point between the Iberian and west European plates. Exact locations inscribed twice (or more): Also part of 'Routes of Santiago de Compostela in France' & Rock Art of the Mediterranean Bassin location no545 (Abrigo de la Ermita de San Urbez near Fanlo) situated within Pyrénées-Mont Perdu borders. Viewable from another WHS: Mont Perdu can be seen from the Parish church of Gavarnie (Route of Santiago in France). Natura 2000: "le site du patrimoine mondial est couvert par un complexe de zones Natura 2000"
132 Community Members have visited.